Yves Klein was born in 1928 in Nice, France. His parents, Fred Klein and Marie Raymond, were both painters. From 1942 to 1946, the artist studied at the Ecole Nationale de la Marine Marchande and the Ecole Nationale des Langues Orientales and began practicing judo. At this time, he became friends with Arman Fernandez and Claude Pascal and started to paint. Klein composed his first Symphonie monotone in 1947. During the years 1948 to 1952, he traveled to Italy, Great Britain, Spain, and Japan before settling permanently in Paris in 1955. Many of Klein's early works were monochromes which were painted in a variety of colors, however, by the late 1950's, he attributed a particular role to the color blue. 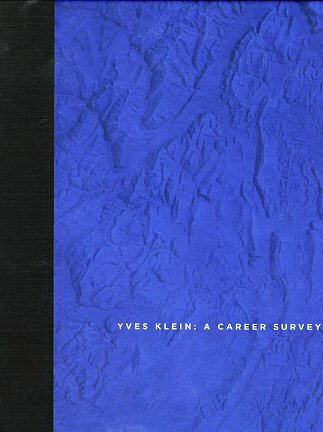 For Klein, blue embodied for him the most abstract aspects of tangible and visible nature, such as sky and the sea. Klein's monochromes became almost exclusively in deep blue hue which he eventually patented as International Klein blue (IKB), although the color was never produced commercially.